I often write and talk about how power elites have pretty much taken over all of the outlets of communication. I’ve assigned an acronym to the main three outlets: “HAM”– for Hollywood, Academia, and the Media. Today I want to recommend to you a major essay that focuses on a vastlly more powerful outlet of communication: the “hidden sphere.” The hidden sphere is basically private life, which is outside the realm of HAM. This means the activities and exchanges that happen in your personal relationships and your private conversations. And it is these interactions which are actually considered the biggest prize of power elites. If you think what you say as “just one person” is not important, think again. The entire point of political correctness is to shut you up as “just one person.” Being “just one person” makes you extremely powerful because what you freely say to others who like you and trust you — whether a neighbor, classmate, co-worker — has the power to shatter the fragile narratives of PC elites. 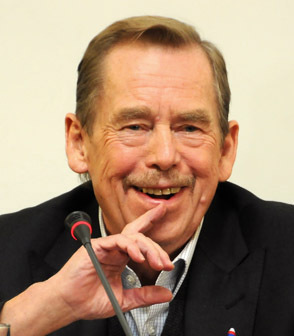 Havel was an independent thinker and a lover of truth and freedom in communist Czechoslovakia. This made him dangerous to the totalitarian regime. Indeed, one could say he spearheaded the “Velvet Revolution” that ended communism in Czechoslovakia after the fall of the Berlin Wall. Havel then served as president of the Czech Republic. His essay can be a bit difficult to plow through – and it’s very long — but it’s fascinating because it reveals to each of us our immense power as individuals. Please get familiar with it, at least its basic premises. From it we can learn how our decision to speak truth in love is an action that goes beyond itself. It illuminates its surroundings and the consequences of that illumination are incalculable. The Hidden Sphere is the sword that can slice through the Gordian Knot of totalitarianism.